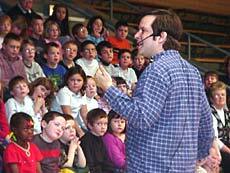 [FEB. 21, 2002] The annual Logan County Spelling Bee took place at the Logan County Courthouse on Feb. 20. There were 14 school representatives involved in this year’s contest, which went 11 rounds and consisted of 71 words. The Regional Office of Education and the Pantagraph sponsor the spelling bee jointly. Alison Kessinger, daughter of Brian and Colleen Kessinger, was this year’s winner. Alison is in the eighth grade and represented the Chester-East Lincoln Elementary School. She won by correctly spelling the word "turbulence." David Finnigan, a sixth-grader at Central School, placed second, and Donavan Dye, an eighth-grader at New Wine Christian, was third. Mary McKeeth from the Bloomington Public Library was the pronouncer. A Pantagraph representative, Ellen Colbeck-Taylor, presented the winner with a trophy, and George D. Janet, regional superintendent of schools, presented new dictionaries to the final three. The three young people will represent Logan County at the Pantagraph Spelling Bee on March 23 in Bloomington. The competition will be at Westbrook Auditorium in Pressor Hall on the campus of Illinois Wesleyan University.